Couldn’t agree more. Two games with similar dynamics – Both England and Mexico got screwed by the referees (Uruguayan Jorge Larrinoda in the England-Germany match and Italian Roberto Rosetti in the Argentina-Mexico game), but Germany and Argentina were so much better than their opponents and both added two goals after the controversial moments, helping the mistakes to be forgotten just a bit as the matches progressed. Bottom Line – England failed again, winning only one match in the World Cup and showcasing a horrible defense, embarrassed by the German attack time and time again, while Mexico, as usual, bow out at the usual round of 16, fifth consecutive time. 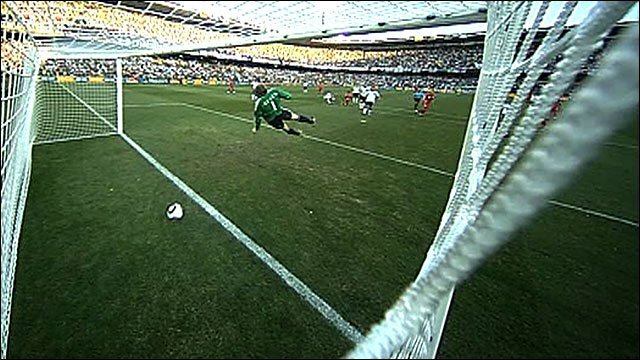 The goal that “was but wasn’t” will probably be talked about for a long long time and maybe, along with the Carlos Tevez goal while being offside, it will get FIFA to wise up and start using Replays, but Germany deserved the win, killing England’s defense which was in total panic and disarray every time two German players displayed the very simple yet efficient double pass. Matthew Upson is a nice Premier League defender, but despite his goal, he shouldn’t be on a team that has aspirations of a long run in the world cup. Gareth Barry was quite pathetic as well, allowing Ozil to get by him without any resistance in the third goal, which pretty much finished the match. Germany? They looked awesome for most of the match. England did have a good stretch near the end of the first half and about 15 minutes in the beginning of the second, trying to find the equalizer, but two counter attacks in three minutes finished them off. Ozil, Muller, Schweinsteiger and the rest deserve all the compliments in the world, before their mega clash with Argentina. And from European animosity, to some Latin flair and efficiency, although Argentina were a lot more efficient than brilliant – Mexico scored one of their five shots on target and 17 overall, while Argentina scored three of their six shots on target and 12 overall. Mexico were the better side in the opening minutes, with Guardado, Hernandez and Salcido testing Romero, mostly from long range, but Argentina did seem a tad lost. 26th minute – Messi found Teves, after a mistake by Oscar Perez (not his first), clearly offside, but apparently enough to hide it from the ref and linesman, putting Argentina ahead. Osorio was the next in the Mexican team to make a crucial mistake, losing the ball to Higuain who scored his fourth goal of the World Cup in very easy fashion. Argentina continued with the pressing in the second half, and Carlos Tevez got his brace, scoring a scorcher from 25 meters, the best goal of the World Cup so far. Maradona seemed comfortable with the result and took out Tevez, putting in Veron. Two minutes later Javier Hernandez showed his scoring prowess with a very impressive goal. Argentina didn’t really try and gain back momentum or control of the match, but Mexico didn’t have anything left in them to make it a real nail biter in the closing minutes. 2. Robert Vittek (Slovakia), David Villa (Spain), Luis Suarez (Uruguay), Asamoah Gyan (Ghana), Landon Donovan (United States), Thomas Muller (Germany) – 3 Goals. 3. Diego Forlan (Uruguay), Elano & Luis Fabiano (Brazil), Tiago (Portugal), David Villa (Spain), Lee Jung-Soo (South Korea), Kalu Uche (Nigeria), Brett Holman (Australia), Samuel Eto’o (Cameroon), Keisuke Honda (Japan), Lee Chung-Yong (South Korea), Javier Hernandez (Mexico), Carlos Tevez (Argentina), Miroslav Klose (Germany), Lukas Podolski (Germany) – 2 Goals. We’ll open with Netherlands vs Slovakia, with the Dutch well aware that underestimating Weiss’ team will be a huge mistake. On the other hand, Holland are a much better team, with or without Robben, and if they press the pedal from the get go, which they haven’t done so far in the tournament, should qualify comfortably. The late show will again be a Latin one, with Brazil and Chile – Chile have had left a lot of impressed fans after the group stage, but when they faced a world class opponent like Spain, couldn’t raise their game. Brazil, despite not being the side that the World wants to see, are good enough to see off Chile.